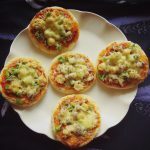 Quick Mini Veg Pizzas are perfect bite-sized snacks for parties. Prepare these mini veg pizzas for your next party and surprise your guests! So, pizza is a commonly prepared recipe in my home. Everyone, in my home, loves pizza and therefore baking a pizza is a common thing for me. Although home baked pizza from scratch is everyone’s favourite, I sometimes also make pizza using ready made pizza base. So, I went to the market to buy a pizza base for the weekend pizza party. There I found something really cute. Guess what? And they looked so cute. I decided to buy them for the weekend pizza party. How to make pizza in microwave oven with readymade pizza base | How to make pizza in microwave? Preparing a pizza with readymade pizza base in a microwave is quite easy and simple. Just make sure your microwave has the ‘microwave+convection mode as that is the mode required for baking. Once you have prepared the pizza (See below for the full recipe) put it on the round table. (You must have got a round table when you would have purchased the microwave. It is a metallic round table). Now place the round table (with the pizza) in the microwave. Select the ‘microwave+convection’ button. Select the timing as 3 minutes. (Yes it gets prepared in such a quick amount of time). Start the microwave. The pizza will be ready when the cheese has melted or you can see a golden brown colour on at some places on the cheese. Take one readymade mini pizza base. Apply pizza sauce on it. Sprinkle Italian seasoning on it. 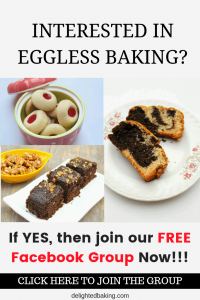 Bake it at 180 degree centigrade for 10 - 12 minutes OR bake in convection microwave for 3 minutes OR take a nonstick tawa/pan and heat it on a gas stove at low flame. Place the pizzas. Cover it with a lid. Cook for 3-4 minutes or till cheese melts. Your homemade mini veg pizzas are ready!